Our Transfer Ownership feature lets you seamlessly add an existing Rachio controller to your account so you can water smarter. Need to add a new (not previously owned or used) controller to your account? Go here! Scan barcode. While installing or onboarding your controller, you will be asked to scan the serial number listed on the controller. If the controller is already attached to another user's account, you'll receive a message in the app letting you know that it's already in use. For security reasons, if you manually enter the controller's serial number, you will not see the option to Transfer Ownership. 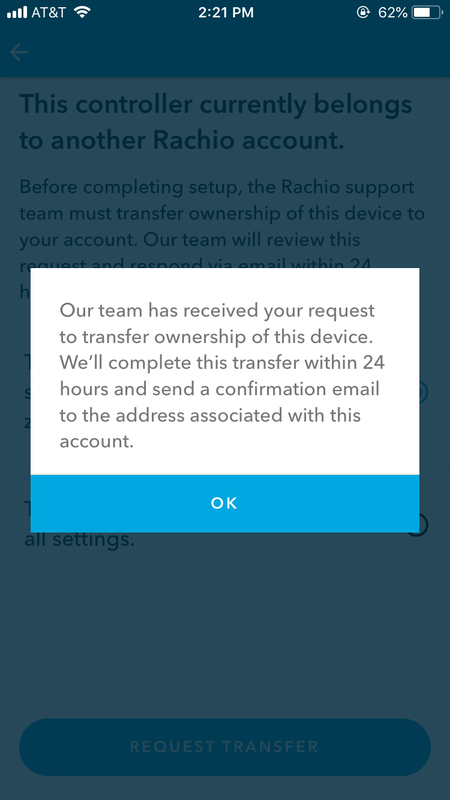 You will need to either go back and scan your serial number, or contact Rachio Support to transfer ownership. Transfer ownership and retain all settings: This is a good option if you've moved into a home with a Rachio installed and you want to retain all settings, schedules, and zone setup information. This option can save time, as you will not need to reconfigure your zones and schedules. Make sure you trust the previously selected settings if you select this option! 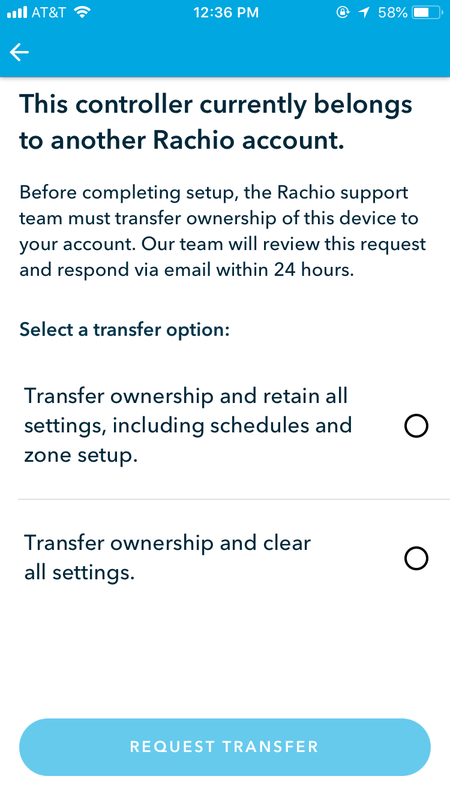 Transfer ownership and clear all settings: This is a good option if you're installing the controller in a new location, or if you want to make sure your Rachio has the correct settings to optimally water your lawn. By selecting this option, you will need to set up your zones and select new schedules before your Rachio can water. Not sure who has previously set up the Rachio, or whether to trust their zone selections? Have you recently changed the landscape or want to confirm your yard settings? In these cases, we recommend clearing all settings. Request transfer. Once you make your selection, tap "Request Transfer." If your request is approved, our support team will add the controller to your account within 24 hours (usually within 2 hours during business hours). You will receive an email confirmation once the controller has been added. Each request must be manually approved in order to keep your controller and information secure. Did you have trouble getting approved? Contact our support team for additional help.